So I decided I was over-thinking it. There wasn't one magical thing out there waiting for me to find it...no perfect toy, keepsake, whatever. So I took a step back and thought about what I would buy someone else's baby...in fact, what I have bought someone else's baby a TON of times that has always been well-received...and I solved the problem! Starting with...the cutest baby long johns you'll ever see! Toasty, durable, tons of color choices and personalized with their name on the trap-door...can't go wrong with these right? Here they are modeled by Miss Hunter a few years ago! So now I had a bedtime theme going, so at least I had a starting point. I thought about this fun turtle (that I may have also purchased for a baby in my life for Christmas this year), but didn't buy it until a saw on a blog that it was ON SALE! As Matt would say...giddy up! The finish was much easier than the beginning...throw in a couple books to round it out and I'm done. I chose this Sandra Boynton book (she's a fav in our house) and this Spanish-English bedtime book. In hindsight it seems so easy...hopefully it will meet the approval of the big kids, aka my toughest critics. I was searching for Christmas ornment ideas and your site came up. 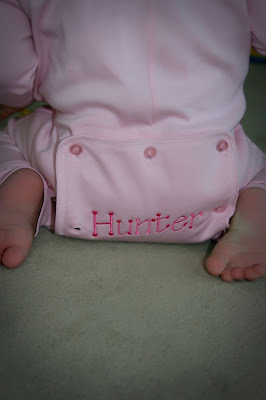 random: do you have a daughter named Hunter? I wanted to name our daughter that, but it seemed that EVERYONE was against it saying it's a boy name. anyway, we ended up naming her Charlotte, but I swear I want another girl just to name her Hunter. how has it been having a hunter? I have heard of a few girl Hunters.